India today launched its indigenous payment gateway, RuPay, to rival networks such as Visa and Mastercard which will work on ATMs and merchant outlets and help in reducing cash transactions. President Pranab Mukherjee unveiled the indigenous card at a function in Rashtrapati Bhavan. Dedicating it to the nation, Mukherjee said, "India is one of the few countries in the world to have its own card payment gateway." Finance Minister P Chidambaram on Thursday made a pitch for boosting foreign and domestic investment to improve growth. He said public sector undertakings (PSUs) alone were expected to pump in Rs 1.33 lakh crore in the current financial year. Buoyed by the success of their diesel variants, Honda Cars India Limited (HCIL) is set to enter the multi-purpose vehicle (MPV) segment with the launch of Mobilio. The new car, in both petrol and diesel variants, will be launched within the next three months. The Delhi High Court today agreed to hear a plea by the Federation of Indian Airlines (FIA) challenging the grant of flying licence to AirAsia India by the Directorate General of Civil Aviation (DGCA). The RuPay is a coinage of two terms — rupee and payment. A variant of the pre-paid RuPay card would shortly be launched by IRCTC, which will help in booking railway tickets. The advantage RuPay platform will provide is that it will lower the cost of transactions, more domestic products can be created, it can reach the unbanked sections and cash transactions can be reduced. The RuPay platform —developed by the National Payments Corporation of India (NPCI) — is being used by certain banks such as ICICI, State Bank of India, Punjab National Bank, among others, for clearing and settlement.The RuPay, which works on three channels — ATMs, Point of Sales (PoS) and online sales, is the seventh such payment gateway in the world. 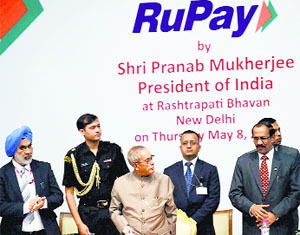 President Pranab Mukherjee said the RuPay, India's payment gateway, would reduce dependence on cash and help in streamlining the card payment systems in the country. He said the volume of card transactions would be significant in the years ahead in India and the RuPay would not only reduce dependence on cash, but would offer users a diverse set of payment options within the country. The President said, "Seven million cards issued so far is only a fraction of the potential." The launch of milk procurement pre-paid card by milk procurement agencies or grain procurement agencies in Punjab are other such variants of the card payment mechanism which only a card payment system developed within the country can appreciate and implement faster. Speaking on the occasion, Financial Services Secretary GS Sandhu said the RuPay would be available at a cost, which is much less than those of international cards. For clearing and settlement of each transactions, banks will have to pay 40% lower fees at the RuPay platform in comparison to other international platforms. The public sector banks have already installed 25,331 RuPay cards enabled ATMs and 9,000 more ATMs would be installed in the current fiscal, Sandhu said. The RuPay card is accepted at all ATMs (1.6 lakh plus), 95 % of PoS terminals (9.45 lakh plus) and most of the eCom merchants (about 10,000) in the country. “Investment must revive in this country. The economy has stabilised. The investment cycle has to start again. Both domestic investment and foreign investment must be encouraged. That will lead to higher growth,” he said while addressing the media at the Congress headquarters. The minister said the capital expenditure plan of 23 PSUs, including Oil & Natural Gas Corp, Oil India Ltd, Indian Oil Corp and NTPC, would go up to Rs 1.33 lakh crore from Rs 1.25 lakh crore in 2013-14. He said the capital requirement of banks in 2014-15 was estimated at Rs 45,528 crore, as against Rs 14,000 crore in the previous financial year. In the interim Budget, the government proposed to infuse Rs 11,200 crore in public sector banks. While keeping inflation under check, Chidambaram said the central bank should keep in mind the need to spur growth. Asked about reports that the RBI Governor may be changed if the BJP-led alliance comes to power, he said Raghuram Rajan had outstanding credentials and the new government must respect the appointment. To a query regarding the international arbitration notice served by British telecom giant Vodafone over the Rs 20,000 crore tax dispute, Chidambaram said the government would contest the notice. “I have already proposed to the Cabinet that since they have gone back and issued an arbitration notice, the original offer of non-binding conciliation stands withdrawn. That offer is no longer valid,” he said, adding the government will defend its case during the arbitration. The Cabinet had in June 2013 approved a Finance Ministry proposal to go in for conciliation with Vodafone to resolve the capital gains tax dispute related to its 2007 acquisition of assets in India from Hong Kong-based Hutchison Whampoa. New Delhi: India will not be able to revert to high growth path of 7-8% anytime soon even if it pursues a strong reforms agenda, says a report by Moody's. "Even if the new government pursues a strong reform agenda, the depth of the issues to be addressed means that the Indian economy is unlikely to return to previous growth rates of around 7-8% in the near future," the report said. The Indian government has only limited opportunities to provide some fiscal stimulus to offset a possible slowdown in capital flows, it said. The company, which has recorded its highest growth (annual sales) in 2013-14, will also be re-launching Jazz by the yearend. The new Jazz, which has already been re-introduced in Japan this year, will be launched in petrol and diesel versions in India. The coming year will also see the car manufacturer consolidating its production at its two manufacturing plants in India and ramping up its dealership network, with a clear focus on entering the Tier-3 cities. Talking to The Tribune here today, Jnaneswar Sen, senior vice-president, marketing and sales, Honda Cars, said the company had recorded a year-on-year growth of 83% in 2013-14, with its highest ever annual sale of 1.34 lakh units across the country. “The Amaze and the fourth generation Honda City have done well. So far HCIL has sold about 80,000 units of Honda Amaze and 30,954 units of 4th generation Honda City. This has helped it beat the downward trend in the car market,” he said. Sen said the launch of Mobilio would help the company make its presence in 50% of the total car market segments. “So far, we operate in just 31% of the car segments. This MPV will have i-DTEC engines which will help Honda set a new benchmark for fuel efficiency. We have yet to decide its price, but it will be competitive,” he said. However, The buzz in the market is that the Mobilio will be in the Rs 8 lakh - Rs 12 lakh bracket. He said the company would be expanding its dealerships from 170 to 230 in India by the end of this fiscal. “We are globally present in 1,076 cities and will now make our presence in 150 more cities. All dealerships are being opened in Tier-3 cities,” he said. Sen said HCILhad recently recalled 31,000 cars, after it discovered that Amaze and Brios had some problem in its brake system. “It is an issue of mis-assembly, which the company discovered on its own. We are pro-actively checking all cars and the problem has been found in only 3,000 units, which will be rectified soon," he said. A Bench of Chief Justice G Rohini and Justice Rajiv Sahai Endlaw posted the matter for hearing tomorrow. The interim application moved by the FIA sought to restrain AirAsia India from commencing its scheduled operations during the pendency of the petition. The plea, moved by senior advocate Mukul Rohatgi, also sought “to restrain the Centre from granting any decision or grant of any further approvals or permissions/NOC/permits in favour of AirAsia India”. It submitted a direction be issued to the DGCA to restrain AirAsia India from scheduling flights and selling tickets to the passengers. The petition alleged that the grant of air operator's permit to the new airline by the DGCA was in "complete defiance of this court’s order as the matter is sub-judice”. SEBI said Etihad Airways' purchase of a 24% stake in Jet Airways (India) Ltd did not amount to a change in ownership and thereby ruled that the Abu Dhabi-based carrier does not need to conduct a tender offer for shares in the domestic carrier.